Wing It: Spread Openness – D'Arcy L. Hutchings, MLIS, Future M.Ed. Task: Create something that encourages others to learn about Creative Commons or to use/create open works. Not-so-secret objective: Use what you have learned to increase awareness of Creative Commons, contribute to the body of open work, or make use of open materials — basically to spread the idea and practice of openness. 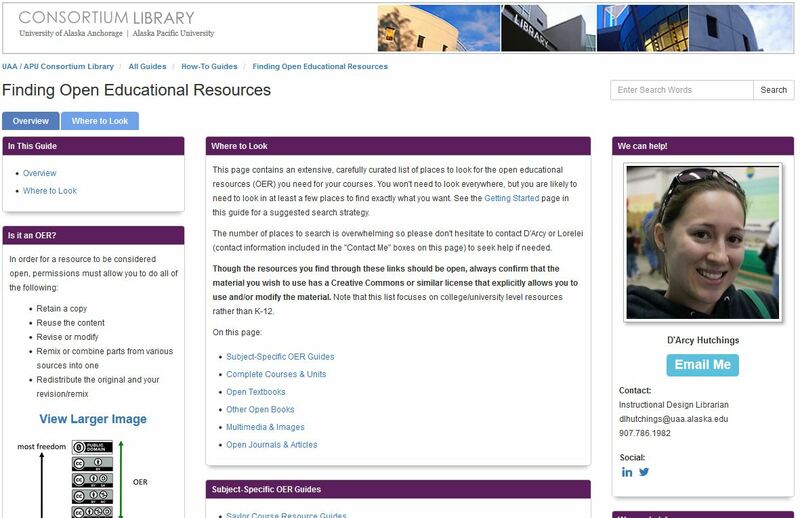 In October 2015, I made a LibGuide detailing how to find open educational resources (OER) for faculty at University of Alaska Anchorage, Alaska Pacific University, and beyond. 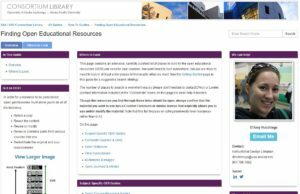 (LibGuides is a content management system — webpage builder — created for and owned by many libraries.) The push for faculty at UAA to adopt OER had just begun and I created the guide to help address the problem of the difficulty of finding quality OER. 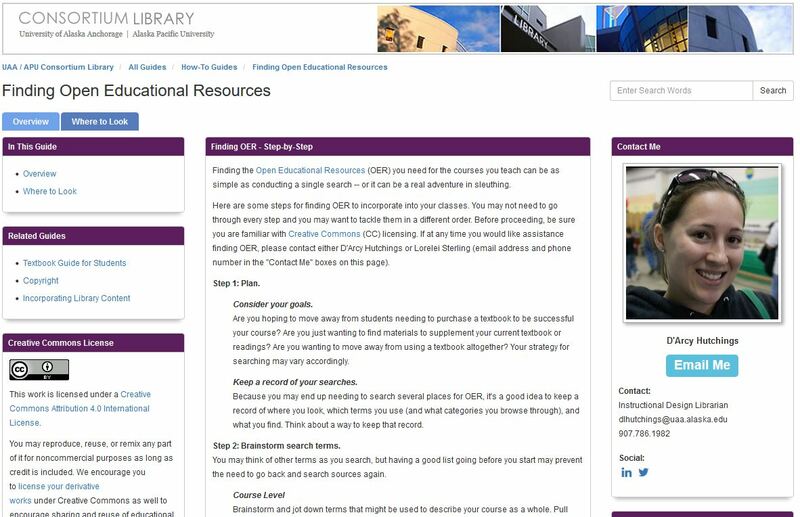 Landing page of the original guide outlining 6 steps for finding and incorporating OER into courses. Second tab of the original guide listing dozens of places to look divided by category. The Guide certainly helped people understand the search process and identify places to look. 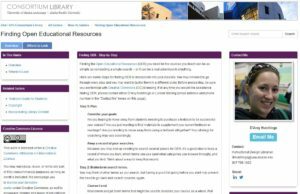 It also is a great tool for librarians to use to help people find OER. However, I have observed faculty being overwhelmed by the guide and the prospect of having to find OER in a comprehensive way. I knew I needed to make a simpler, more approachable starting point for people to get in and dabble, and pull the current guide parts aside for the more dedicated faculty who are unable to find what they need easily. I used this assignment as an excuse to make that Guide revision a priority. I completely changed the organization of the guide (and the boxes withing each page), added content, and edited content. Here is my revised Finding OER Guide. This entry was posted in ED654 Digital Citizenship, ONID, Open Educational Resources (OER) and tagged bling, ED654, makeandshare, nousion, ONID, wingit by D'Arcy Hutchings. Bookmark the permalink. Well done. The reorg, particularly putting the Quick Start front and center. I hope some outher Nousioneers choose to do his assignment!